I’m always up for reading more titles from Severed Press – they’re always action-packed, fast-paced and full of twists and turns. So when Severed Press author Robert J. Stava contacted me and asked if he’d like to read his latest title – The Lost World of Kharamu – I was intrigued. The blurb easily sold the book to me, like most titles from the publisher – the idea of an updated Jurassic Park, blended with a bizarre, 1950s-themed take on Westworld really appealed to me, and felt like the perfect title to jump into after along period of binging on intense horror titles. 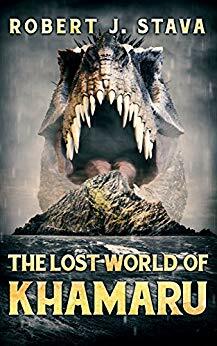 As I’ve often mentioned in previous reviews, Severed Press covers are always impressive and highly engaging, and the one for The Lost World of Kharamu is no different; a mysterious, ominous mountain range towers over an isolated island, and above everything looms the jaws of a ferocious dinosaur. All in all it promised to be an exciting and engaging title, and I jumped into it with gusto. It certainly starts off promisingly enough, efficiently and effectively laying out the parameters of the resort and the budget-cutting tactics of the mega-company running it, as well as highlighting the inherent dangers of having dinosaurs being used as tourist attractions. I very quickly noticed that the author has a real flair for worldbuilding and a good grasp of descriptive language – the prologue really brought the story to life in only a few pages. The descriptions of the lush, verdant island of Kharamu are also well-done and really make the island immersive for the reader. I also noticed a nice sense of humour running through the entire novel, one that’s slightly tongue in cheek – the handsome, intensely charismatic paleontologist, a crazed stereotypical Russian smuggler, megalomaniacal Billionaire, and an over the top Jurassic Park-style resort. That’s always a good sign coming into a book – where a writer has confidence in his writing and is having a bit of fun as a result. The long-suffering Taylan is an enjoyable protagonist, weary but smart as a whip. Talking of whips, I know it’s beyond a stereotype to compare a character to Indiana Jones, but he does fit all of the characteristics of the character trope; fortunately he’s well-written and sympathetic in a world-weary way, and a wry sense of humour. I also appreciated that he focuses on dinosaurs, which is at least a somewhat original take that ties into the overarching narrative. In fact, all of the main characters are bright and engaging, the same sort of larger than life personalities that you see in AAA Hollywood action films; they’re all explored in depth, meaning none of them feel like cardboard cutouts that aren’t worth following or caring about. In terms of the overarching plot, Taylan is brought in by an insufferable old school friend to act as a paleontology consultant on a new venture – the titular Lost World of Kharamu. Taylan rapidly finds himself engulfed in corporate machinations, mysterious investors, and private military forces with a lot of firepower. There’s also a good sub-plot about two workers on the island chasing after what appears to be an ancient ghost, which is also amusing in places and is effective at breaking up the main plot also providing some hooks for a potential sequel or follow-up in the same universe. One of the best things about The Lost World of Kharamu is that there are some excellent action scenes in this book, and Stava has a knack for ensuring that they all unfold at breakneck pace. Perhaps my favourite was an early car-chase across London with Taylan in the back of a Black Cab, which was certainly a first for me; there’s a real energy and humour to the whole sequence which had me on the edge of my seat while also chuckling out loud several times at the sheer chaos Stava unleashes. These action scenes are reminiscent of the best Hollywood action blockbusters – the book itself often reads like it should be converted to a script and casted with someone like Tom Cruise in the lead. In addition, Stava has a knack for effectively and engagingly portraying the sort of machinations, plotting and (often literal) backstabbings that would take place in the corporate-dominated landscape of something like Kharamu, even down to the various antagonists fighting amongst themselves. Stava is also very good at effectively skewering the insane lifestyles led by those with far too much money like Peyton – with all the class-based condescension and inherent racism that involves. That skill also extends to the corporate espionage and cutthroat nature of research and development – the lengths mega corps will go to get an advantage over their rivals. Of course, the real stars of The Lost World of Kharamu are the bio-engineered dinosaurs themselves, as they absolutely should be given the nature of the story. They’re well introduced into the narrative, and with what’s obviously an impressive amount of research put into their descriptions, based on the latest knowledge about various species; many of them have feathers, and there’s even some wry commentary on the difference between Hollywood depiction on the big screen and the cold reality of scientific research. The herbivores are impressive, Stava giving a good idea of their size and mass that gave them a true presence; and a variety of vicious carnivorous predators also feature, often hunting on more than just the odd Diplodocus or Brontosaur. Even a variety of more exotic, and lesser-known dinosaurs are included, which adds some variety and avoids the usual stale trope of relying on a tiny handful of the best-known species. Stava’s passion for dinosaurs and the academic research into them really shines through, and therefore makes the scenes where they appear even more engaging. Plus when they finally are unleashed into the entire island, free of restraints, there’s a delightfully gleeful tone to the chaos unleashed – blood, gore and body parts flying around as nature reasserts itself over mankind. Finally, it’s a very small thing to note in a review, but given its rarity I think it deserves to be mentioned: Stava actually provides a small list of sources in the author’s note at the end of the book. It’s a fantastic idea that I wish more authors would actually provide, because the sources were actually a series of fascinating articles that really expanded upon a lot of the dinosaur-related action that took place in The Lost World of Kharamu. Kudos to Mr Stava for taking the time and thought to give his readers some additional reading material. Overall, The Lost World of Kharamu is fast-paced, action-packed and generally hugely enjoyable – like a more realistic and even more action-packed version of Jurassic Park. The best of the book is to be found in the scenes featuring the dinosaurs that are the star attraction of Kharamu – the author’s passion is very clear, and readily brings the dinosaurs to life in all of their glory. Like the afore-mentioned dinosaurs, brought back to life through genetic meddling, there are a few flaws in the title; it could do with a good copy-edit to iron out the typos and missing words, and the way certain secondary characters were portrayed had me rather puzzled in a bemused way. But these issues are relatively minor at the end of the day, and don’t detract from the impressive work that Stava has undertaken. The Lost World of Kharamu is very much a must-buy for fans of the creature-feature and action-adventure genres.